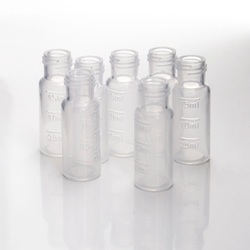 Our product range includes a wide range of 1.5ml pp short thread vial transparent 9mm thread 1.6x32mm hplc, 2ml amber sample screw vials, 250ul conical micro-insert, vial inserts micro-insert, 1.5ml clear screw neck vial w/write-on spot and hplc solvent inlet filter. 1.Standard vials for GC and HPLC. 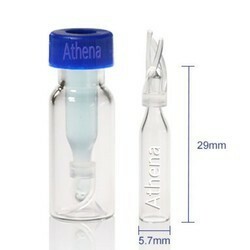 2.Vials with integrated Micro-Insert are available. 3.11mm hand crimper & 11mm Decapper. 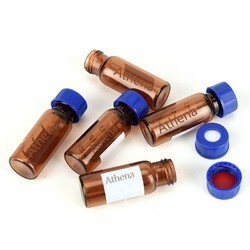 4.Vials have a 40% larger opening than standard opening aluminum seal vials. 5.Vials are manufactured of Clear or Amber borosilicate glass. 6.The standard 12x32mm profile is compatible with 11mm aluminum seal closures. A 316 stainless steel tip with a Tefzel collar seals to a corrosion-resistant 316 stainless steel filter element. The slip-on filter easily attaches to the pump inlet line, without the use of wrenches. The universal 1/8" OD tip accommodates standard PTFE tubing inner diameters. The cylindrical filter is standard 10 μm porosity. Fits Altex, ISCO, LDC, Varian, Waters, PerkinElmer, and other pumps. Bottom-of-the-Bottle 2 μm Filters - These Upchurch filters have an integrated 2μm PEEK sparging frit. Connect to 1/8 inch tubing through push-on connectors. Autosampler vials are often used in conjunction with the Shimadzu, Spectra Physics, Varian, and other autosampler. 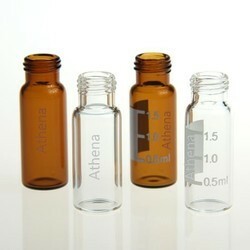 By the bottle or the colorless type 1 A 1 B grade amber borosilicate glass type, and can be written with a label for sample identification on the bottle. Autosampler vials are using high-quality imported raw materials from abroad, with a high temperature, corrosion-resistant properties; lids are made of polypropylene with high-quality, precision manufacturing tolerances, controlled manufacturing environment to quality and service quality to win the trust of customers; autosampler bottle washer with the highest quality materials to ensure proper function, widely used multiple injections and / or a longer sampling period design and meteorological chromatograph and liquid chromatography. Diameter of lid is 9 mm, thickness is 1 mm. Solid lid without center hole. Color: Transparent bottle without scale, without writing labels. Bottle is make of glass , 9-425 screw thread , Transparent or amber glass, with label and filling lines. Septa: Red PTFE/white silicone, size is 9 * 1 mm. Septa can be resistance temperature from -60 degree to 200 degree. Cover: 9 mm blue polypropylene threaded cover, Solid lid without center hole. 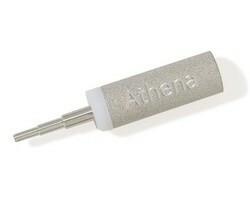 Match: 9-425 models can match instrument of Agilent Brand. Packag: Neutral packing, no logo. For sealing sample vials for temperatures up to 210 °C. Low background peaks, very low permeability, not recommended for repetitive injections from the same vial. Includes aluminum caps and star springs. Preassembled. Note: Due to the patent which PerkinElmer holds on the closures system of the Headspace vials, the caps, septa, and star springs cannot be sold separately. 20mL, Clear Glass, 22.5*75mm, 20mm Square Rim, Flat Bottom, Crimp Top Headspace Vial,100pcs/pk. 20mL, Clear Glass, 22.5*75mm, 20mm Beveled Edge, Flat Bottom, Crimp Top Headspace Vial,100pcs/pk. 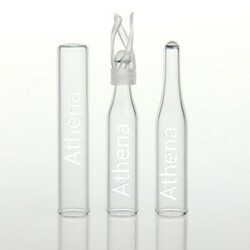 20mL, Clear Glass, 22.5*75mm, 20mm Beveled Edge, Rounded-flat Bottom, Crimp Top Headspace Vial,100pcs/pk. 20mL, Clear Glass, 22.5*75mm, 20mm Beveled Edge, Rounded-flat Bottom, Short Neck, Crimp Top Headspace Vial suitable for PerkinElmer, 100pcs/pk. 20mL, Amber Glass, 22.5*75mm, 20mm Beveled Edge, Rounded-flat Bottome, Short Neck, Crimp Top Headspace Vial suitable for PerkinElmer, 100pcs/pk. Silver, 20mm Open Top Aluminum Crimp Cap, pre-assembled with 20*3.0mm Natural PTFE/White Silicone Septa. 100pcs/pk. Silver, 20mm Open Top Aluminum Crimp Cap, pre-assembled with 20*3.0mm Natural PTFE/Blue Silicone Septa. 100pcs/pk. Silver, 20mm Open Top Aluminum Crimp Cap, pre-assembled with 20*3.0mm White PTFE/White Silicone Septa. 100pcs/pk. Silver, 20mm Open Top Aluminum Crimp Cap, pre-assembled with 20*3.0mm White PTFE/Blue Silicone Septa. 100pcs/pk. Silver, 20mm Open Top Aluminum Crimp Cap, pre-assembled with 20*3.0mm Red PTFE/White Silicone Septa. 100pcs/pk. Looking for Vials Cap Septa for GC HPLC ?